A whopping 60% of prospective BI software buyers are business users–not IT professionals. About half of all prospective buyers are looking for BI software because they need to better visualize their data. Almost all prospective BI software buyers want integrated suites, but remain unsure of a deployment model. The most sought-after BI tools are dashboards and scorecards, and the most-desired BI feature is customizable dashboards. The majority of buyers are mid-size to large companies, with many coming from the healthcare and manufacturing industries. One of the biggest demand among non-technical business users is to be able to use a BI software independently–without depending on the IT department. 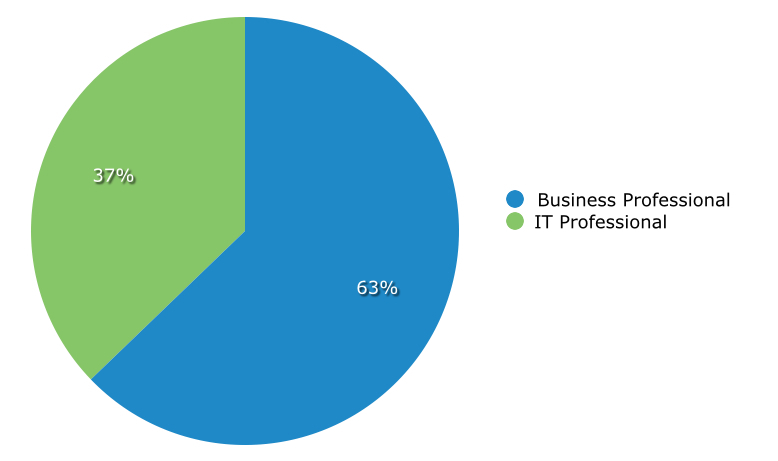 Which explains why more than 60% of prospective BI software buyers were not IT professionals, but instead identify with job titles such as financial offer, operations manager, and marketing executive to name a few. Though 37% of buyers were IT professionals, the findings reflect this year’s Magic Quadrant Gartner report that predicted 2014 would be a year in which the need for, “making ‘hard types of analysis easy’ for expanded set of users” will dominate the BI market requirements. Looks like Gartner was right on target. Since unifying data and uncovering insights is extraordinarily useful to any department, most companies looking for a BI tool want a solution that is built with non-technical users in mind. To accomplish this requirement, it’s important to look for a BI tool that has a powerful back-end technology to make the more technical and complicated tasks of preparing data for analysis easier. Also, BI solutions that have a user-friendly UI with features such as drag-and drop capabilities and customizable dashboards is essential for allowing business users to create dashboards on their own. Remember, what is easy-to-use for a data scientist or an IT admin, can be a nightmare for the regular business user. If companies don’t want their IT department to become a bottleneck, or they truly hope that all departments will gain a hands-on approach to understanding their data, building dashboard and reports, and making informed decisions, choosing a BI tool with robust technology and seamless user experience is critical. With a nearly 40% vote, the top reason prospective buyers were on the hunt for a BI tool is because they wanted to better visualize their data. The second reason was that buyers wanted an update to an existing software, or had never bought a BI solution to begin with and needed one now. Others were looking to automate and unified scattered data sets, specifically mentioning the need to pull data from places such as SQL servers, Microsoft Dynamics, SharePoint and Excel. Finding a BI solution that hasbuilt-in connectors to popular data sources is key for fulfilling this BI need. Nearly all buyers agreed (95%) that they needed an integrated suite–an all-in-one, single BI system that houses multiple tools like dashboards, reporting, and scorecards. This is compared to a single BI application that only serves one purpose—often called a best-of-breed solution. Yet, when it came to deployment model, 84% of prospective buyers were undecided. Among those who chose a deployment model, 66% preferred an on-premise solutions to a cloud-based one. The most sought-after BI tools are dashboards and scorecards, with query and report writing coming in a second. Though, 82% of integrated suite buyers expressed a strong interest in also acquiring a solution that includes query and reporting writing as one of the tools. Other hot tools in order of preference: data warehousing, ETL capabilities, and OLAP tools. Healthcare and manufacturing are leading the way as BI software buyers as 13% of all prospective buyers were in the healthcare industry, and another 12% in the manufacturing industry. This doesn’t come as much of a surprise considering the enormous amounts of data those industries hold, and how healthcare organizations is an industry taking part in the data revolution by using innovative BI technology to transform their organization’s strategy and efficiency levels. Software, government, banking/finance and retail were next as leading BI software buyers, though a large 46% were of the “Other” category that included fields such as non-profit, education, distribution and more. The majority of companies buying BI solutions today are no longer the large enterprises with endless amount of resources–they are mid-size organizations with between 101-500 employees. While 36% of buyers’ companies were mid-sized, large organization came in second with 30% of the pie, defining themselves as over 1,001 employees. Most of the buyers’ current software does not address their BI needs. With 35% using a CRM or an ERP system to collect, analyze, and report data, and another 20% using Excel as their BI tool, companies knew they needed a BI solution to better gather, collect, and analyze their data. If you’re an Excel user and feel their pain, learn the 5 signs it’s time to ditch Excel here.